Beautiful 4 BR 3.5 BA huge heated in ground pool, walk to Cherry Beach! Property Size 2,275 sq. ft.
Delightful cottage style renovation that has been featured in Better Homes and Gardens Renovation magazine. This warm welcoming home is just minutes walk to the beautiful Cherry Beach in Harbert, MI. 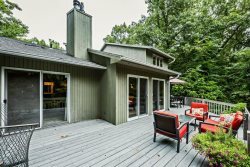 Large 1/2 acre yard surrounded with majestic pines embraces the new 20 X 40 heated lighted in ground pool, concrete surround with large decks and screen porch makes entertaining a breeze. Home is in immaculate condition. Honed marble baths, wide plank pine floors and open floor plan and stainless steel appliances in addition to the extra large comfortable living room and family room furniture make this home a great spot for a family or friends getaway. The master bedroom is furnished cozily with a king bed, en-suite bathroom, television and chaise lounge. The second bedroom has a queen bed, the third bedroom a queen bed and the fourth two full beds. The property is located 3 blocks from the Lake and there is a path which you can take through the back of the house. Eveyone I talked to was outstanding. My favorite rental and I have rented many many homes in this area!